If you are considering throwing a backyard “BabyQ” shower and wondering what would be a good menu idea, below we have the menu that we did for the shower that I threw. You can click on each blue link to go through and check out the individual recipes. The reason we went with the menu that we did, is that you can do a lot of the prep for these types of items the day before. This saves precious time the day of the wedding, especially if you don’t have a lot of people helping you with the set up. If you are setting up your buffet outside, make sure it is in the shade, but always better to set buffet up inside if possible. So below each recipe are some tips on what you can do ahead of time on each of these recipes. Night Before: Remove Skin from all the chicken thighs. Set aside in a bowl and plastic wrap securely. One Hour before: Put BBQ Rub on Thighs. 40 minutes before serving: BBQ Chicken Thighs. Toss with BBQ Sauce (as per recipe instructions) at last minute. Set aside in a chafing dish with heat under to preserve until serving. Night before, right before you go to sleep, marinate the ribs in the Dark Rum. In morning, pull ribs out of marinade and cook off slowly indirectly as a rack. Allow to cool properly and then slice all ribs to individual size. Set aside in refrigerator in a large plastic wrapped bowl (after cooled). When you pull Chicken thighs off BBQ (Or at same time if you are talented or have two BBQs and trust someone else to handle, put Ribs on BBQ to warm back up over direct heat. After warmed for about 2 minutes per side (4 min total) pull the ribs back into the large bowl and toss with BBQ sauce. Put back on grill to carmelize the BBQ sauce nicely watching closely not to burn. 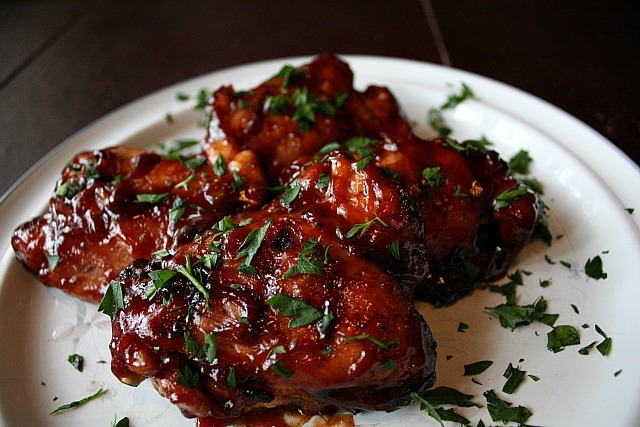 Then pull off after the BBQ sauce is good and ribs are warmed up–toss in the bowl with another coating of BBQ sauce and then set out on serving table also in chafing dish that is set up to keep it warm. 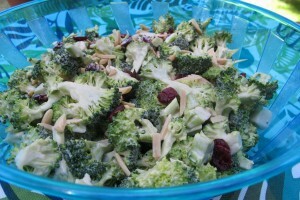 Two days before: Chop & Rinse All Broccoli, set aside in large bowl in fridge. Slice the red onions and then wrap in a lightly damp paper towel and store in an airtight container. Toast slivered almonds or Hazelnuts. Make Dressing. 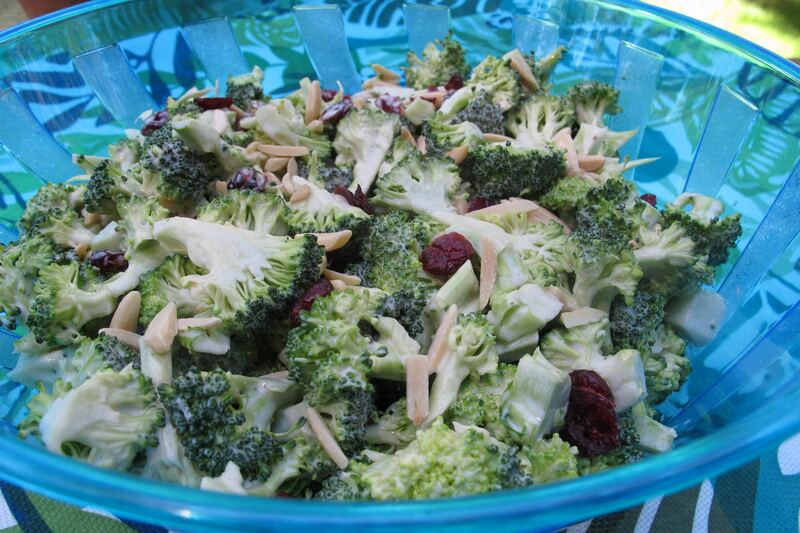 Set dressing aside in another bowl, do not combine yet with broccoli. Night before: Combine Broccoli, dressing & Red Onions. An hour before: Add in Toasted Almonds & Craisins and Golden Raisins and toss. Re-Toss and Set out on table once hot items on table. Mayonnaise based dressings you never want to leave sitting out for too long and especially want to keep them out of the sun. Fruit Salad is something you should make the day of the party so the fruit stays fresh and doesn’t get too soggy. Here is a cute idea for a fruit salad for a baby shower though–Take a large watermelon and cut out a “basket” carve it out like picture attached here–then take a cantaloupe and make a “head”, take some grapes and other fruit pieces to make a face and set that inside the watermelon. 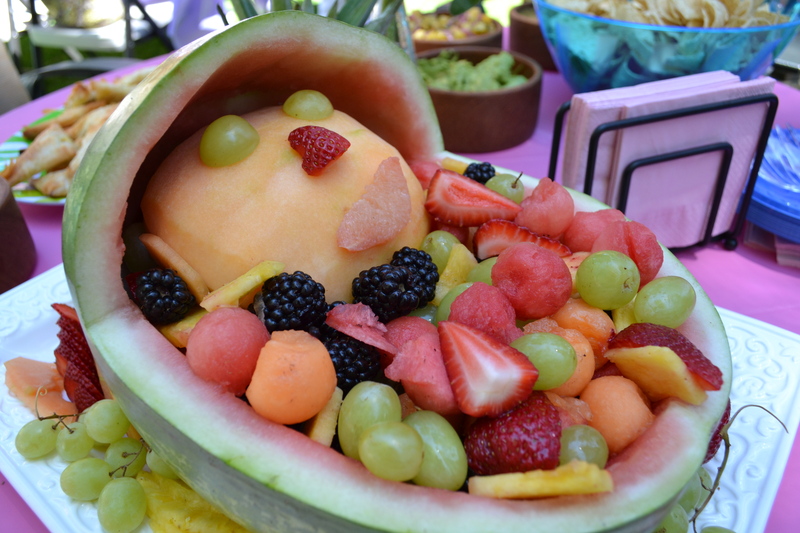 Fill the watermelon with other fruit you decide to cut up for your party and voila! A cute idea that really dresses up your buffet line. Make Raspberry Walnut Vinaigrette a week ahead of time (Recipe in above link). If making your own toasted honey glazed almonds do up to a week ahead of time, though there are some great pre-packaged ones at Trader Joe’s if you have a Trader Joe’s in your area. Day before: Slice Red onions and soak in water (this helps to take “the bite” out of them). After soaked for 20 minutes or so, remove from water and seal in plastic ziplock bag. Morning of: Rinse and chop lettuce. Leave in Salad spinner. Chop cucumber and Tomatoes –set aside. 15 minutes before serving: Combine all ingredients in serving bowl and toss to serve.